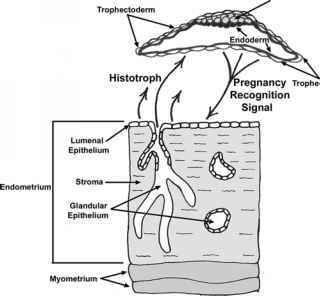 Before birth, the fetus is well protected by the maternal placenta, which delivers all essential nutrients to the fetus but blocks the transfer of most harmful substances. At birth, this protection ends abruptly and the newborn must absorb essential nutrients from milk. At the same time, the newborn encounters numerous harmful antigens and microorganisms from its new environment. Fortunately, the mother continues to provide the newborn some protection via milk secretion from the mammary glands, particularly via the first milk, colostrum. This fluid provides the newborn not only essential nutrients, but also a specific intake of various bioactive substances that facilitate the adaptation of the newborn to life outside the mother. This article summarizes the composition and biological effects of colostrum based mainly on data from the pig. The information would apply also for other large farm-animal species (e.g., cattle, sheep, horse), but may differ from that of species not entirely dependent on colostrum ingestion for neonatal adaptation and transfer of passive immunity from mother to offspring.